Background: Celiac disease (CD) (also called gluten-sensitive enteropathy and nontropical sprue) is a known entity since 1888, is a common immune-mediated enteropathy due to allergy to gluten, with a prevalence of approximately 1% worldwide. It has wide spectrum of manifestations ranging from failure to thrive, gastrointestinal symptoms to various autoimmune diseases and malignancies. Materials and Methods: The clinical profile of patients diagnosed as CD, presenting at tertiary care hospital of armed forces, was evaluated. The patients were diagnosed as CD as per ESPGHAN guidelines on the basis of symptoms, positive serology, and histological findings (duodenal biopsy). After history and clinical suspicion of CD, IgA anti-tissue transglutaminase antibody was done. Complete history, physical examination, and baseline investigations including complete blood counts, serum glucose, thyroid function tests, etc., were recorded. 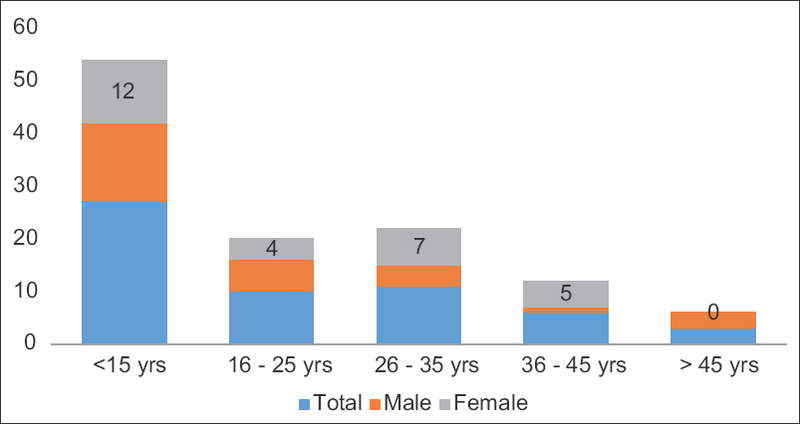 Results: The average age of the cohort was 21.03 years (range 3–75 years). The most common presentation was diarrhea (80.7%) followed by anemia (63.2%) and weight loss (56%). Anemia was found to be second most common presentation after diarrhea and was seen in 63.2%. The prevalence of autoimmune conditions, namely, type-1 diabetes mellitus and thyroiditis were seen in two cases (3.5% each). Conclusion: CD is a common immune-mediated condition though typically presenting with gastrointestinal symptoms, atypical manifestations are also not uncommon. Suspicion of this condition and the appropriate investigations should not be delayed in patients presenting with either typical manifestations or uncommon presentations. Background: Epidural anesthesia is the most commonly used technique for inducing surgical anesthesia and postoperative analgesia in patients undergoing lower limb surgeries. Fentanyl as an adjuvant to epidural local anesthetic has been used for a long time. Dexmedetomidine is a potent and highly selective α-2-adrenoceptor agonist with analgesic potency. Aim: The aim of the present study was to compare the effect of dexmedetomidine and fentanyl as an adjuvant to epidural bupivacaine in lower limb surgeries. 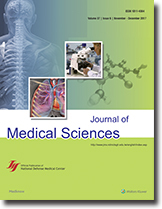 Materials and Methods: Sixty patients belonging to the American Society of Anesthesiologists' Grade I or II who were undergoing lower limb surgery were randomly divided into two groups. Group BD: received epidural study solution of 38 ml of 0.25% bupivacaine hydrochloride + 1 ml of 100 μg dexmedetomidine + 1 ml of normal saline. Group BF: received epidural study solution of 38 ml of 0.25% bupivacaine hydrochloride + 2 ml of 100 μg fentanyl. Onset and maximum level of sensory blockade, time to attain maximum sensory level, time to complete motor blockade, time for two-segment regression, duration of analgesia and motor block, heart rate, and blood pressure were observed. Pain and sedation were assessed by numerical rating scale and Ramsay Sedation Scale, respectively. Data were recorded and statistically analyzed. Results: The onset of sensory blockade and time to attain maximum sensory level in Group BD were earlier than that of Group BF (P < 0.001). Duration of analgesia and motor blockade in Group BD were significantly more than that of Group BF (P < 0.001). Postoperative visual analog scale was reduced statistically significantly in Group BD (P < 0.001). Conclusion: Dexmedetomidine as an adjuvant to epidural bupivacaine is a better alternative to fentanyl with higher analgesic property. Background: Exercise is one of the optimal and alternative treatments for type 2 diabetes (T2DM). Although the effect of a single bout of exercise on insulin sensitivity is reported to persist only for 2–3 days, effects remain unclear of a 12-week aerobic exercise training on insulin sensitivity, quality of life (QOL), and depression status over time as exercise training duration increases in patients with T2DM. Objectives: To investigate the effects over time in patients with T2DM of a 12-week aerobic exercise training on insulin sensitivity, QOL, and depression status. Materials and Methods: Purposive sampling was used to recruit 17 T2DM patients. Participants underwent a 12-week, supervised, moderate-intensity aerobic exercise training three times per week, 30 min per session. 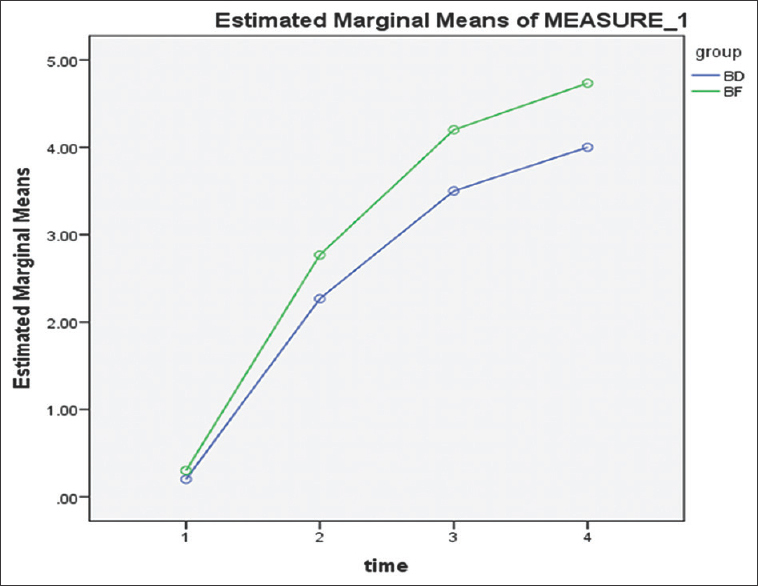 Outcome indicators including insulin sensitivity (measured by a 2-h oral glucose tolerance test [OGTT] and homeostatic model assessment-insulin resistance [HOMA-IR]), QOL (Medical Outcomes Study Short Form 36), and depression status (beck depression inventory scale) were evaluated at baseline and at 4-week intervals. Results: A final 13 eligible participants completed the study. For every 4-week increase in duration of exercise training, there was an increase over time in insulin sensitivity, including a decrease over time in OGTT glucose area under the curve of 66.92 min/mmol/L. Glucose concentrations decreased over time at 60, 90, and 120 min after an oral glucose challenge. Further, the HOMA-IR decreased over time as the duration of exercise training increased. QOL and depression status improved significantly during the training. Conclusions: Moderate-intensity exercise training improves insulin sensitivity, QOL, and depression status in T2DM patients, particularly over time within a 12-week exercise training course. Background: Depression is one of the more common mental health conditions found among people suffering from chronic diseases. Its presence in patients with type 2 diabetes could hinder the adherence to and effectiveness of treatment. Most studies on depression among patients with diabetes are hospital-based suggesting the need for a community-based study to assess the correlates of depression among patients with diabetes. Aim: This study aimed to estimate the prevalence and to identify the factors influencing depression among patients with type 2 diabetes in Udupi taluk situated in southern India. Subjects and Methods: This study recruited 200 patients with type 2 diabetes from both rural and urban areas. Demographic, clinical, and diabetes-related information were collected using a semi-structured questionnaire. Depression was assessed using Patient Health Questionnaire-9; a standardized questionnaire developed in the United States of America and validated in the Indian population. Results: The prevalence of depression among patients with diabetes in the community was found to be 37.5%. Most frequently, depression was mild (42, 21%) in nature with severe depression (9, 4.5%) seen the least. Several factors were found to be positively associated with depression including female gender, rural residence, unemployment, and the status of being unmarried. The presence of diabetic complications and other chronic diseases such as hypertension and obesity also were found to be associated with depression. Conclusion: Depression was found to be particularly high among the study population. Since depression could significantly hinder patient's adherence to treatment, there is an urgent need for early diagnosis and treatment. This calls for the integration of mental health care into the management of diabetes. Background: Poor glycemic control in patients with diabetes mellitus can increase associated complications and mortality. We use the telehomecare system in patients with diabetes and investigate the associated impact in clinical practice. Materials and Methods: The purpose of the study is to examine the effectiveness of the telehomecare system on diabetic self-care. The telehomecare system incorporated into the daily care program in the experimental group. A cloud health-care platform designed for information storage and exchange be constructed and monitored by case managers. Comprehensive care instructions and in-time consultation in case of abnormalities were provided. The patients in the control group adopted conventional care program. Self-care questionnaires were completed by both groups before and after the study. All participants measured before the experiment and at 4 months after. Results: The participants were 117 patients (including 56 at the experimental and 61 at the control group), which recruited from a community hospital in New Taipei city, Taiwan. In two-way mixed design ANCOVA, in self-care behaviors, there are significant differences between two groups. The outcome of experimental group is superior to the control group both in posttest. However, there is no significant difference between two groups in subscales of foot care and athletics care. Moreover, there is no delayed effect in self-care behaviors of drug adjustment and blood sugar surveillance. 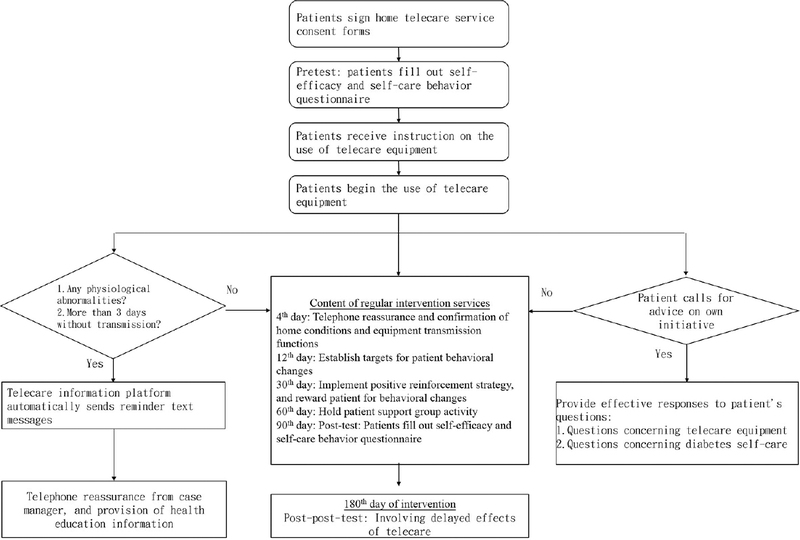 Conclusions: This observational study revealed early intervention model to the health education strategy, the telehomecare might strengthen self-care behaviors of the participants. To the future study, we can put emphasis on the diabetes mellitus patient's foot care and exercise behaviors. The telehomecare model could also become the important health-care policy for the government in the future. A 55-year-old male underwent complete resection of a T12 intraspinal tumor and subsequently developed dizziness and loss of consciousness on postoperative day 2. A subdural hematoma (SDH) of the left frontotemporoparietal space with uncal herniation was seen on computed tomography. This unusual case of acute intracranial SDH after spinal surgery is discussed, and literature review is performed. We aim to discuss the possible mechanism by which this complication occurred. Anomalous left coronary artery arising from the pulmonary artery (ALCAPA) is a rare type of congenital coronary abnormality that may be associated with early infant mortality and sudden adult cardiac death. We report a case regarding a 23-year-old male who collapsed during a marathon race and was resuscitated with cardiopulmonary resuscitation. Subsequent workups verified the diagnosis of ALCAPA. The patient underwent surgical intervention with obliteration of the ALCAPA orifice and coronary artery bypass grafting with left internal mammary artery to left anterior descending coronary artery. The procedure was done smoothly, and he was discharged uneventfully.